Having lauded the beauty of the Gressa Minimalist Foundation in the past (swatch heavy review HERE), I am thrilled to introduce the lastest additions to the Gressa family: Lumiere Luminous Complexion Fluid and Jolie Lip Boost. These color-saturated formulas are versatile and gorgeously incandscent for naturallly glowing skin. Above (from L-R): Swatches of the Gressa Illuminating Serum, Lumiere Fluid in Amelia, Lumiere Fluid in Elise, Jolie Lip Boost and Minimalist Serum Foundation in 3.5. The Lumiere Luminous Complexion Fluid is a plush formula with skincare benefits that applies sheerly and blends like a dream. A single pump is all that is necessary to create a long-lasting, flushed, lit from within look that translates beautifully on eyes, cheeks and even lips. Amelia is a bright peachy papaya hue with golden undertones. I love applying this shade to my eyes for a warm effect. Topping Amelia with a shimmering taupe eyeshadow powder (as illustrated in the images that follow) instantly takes this from day to night. Elise is a bold coral pink that looks amazing buffed onto the apples on the cheeks for a fresh-faced countenance...absolutely radiant. A gorgeous serum pigment adaptable to any skin tone. Possibilities are limitless. Use it on cheeks, eye lids or lips for a quick tint. This unique formulation nourishes while providing luminosity and ultimate versatility. Above: Gressa Jolie Lip Boost is a mid-toned coral with a radiant finish. 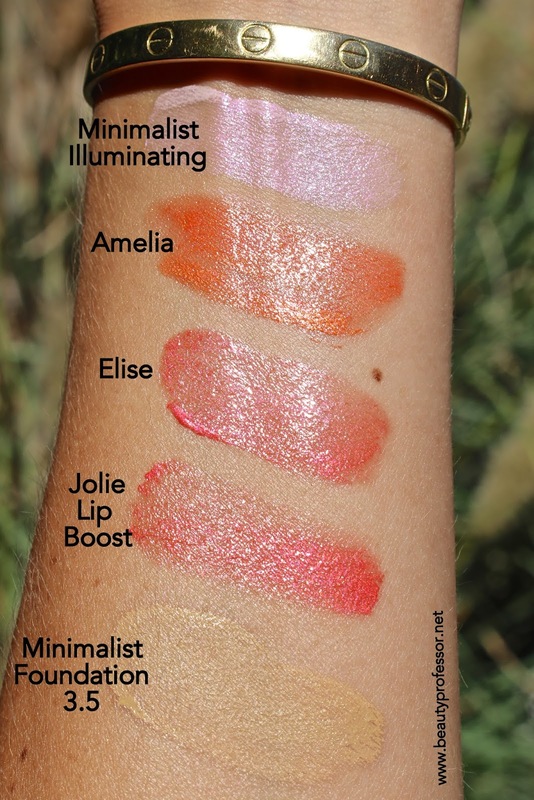 The Jolie Lip Boost is equal parts hydrating lip treatment and pigment-drenched lip color; I was actually shocked by how much color was imparted by a single swatch! This juicy coral is a perfect hybrid, tonally-speaking, of the Elise and Amelia Lumiere Fluids and makes lips look lush and full for hours. Treat yourself to this gem...you won't regret it. INGREDIENTS: *Ricinus Communis (Castor) Seed Oil, *Butyrospermum (Shea) parkii Butter, Magnifera Indica (Mango) Butter, *Copernicia Cerifera (Carnauba) Wax, *Seabuckthorn Seed Oil, Ubiquinone (CoEnzyme Q10),*Rosmarinus Officinalis (Rosemary) Extract, Tocopherol (Vitamin E) Non-GMO, Mica, Iron Oxides. *CERTIFIED ORGANIC. Above: Lumiere Fluids in Elise and Amelia (on eyes and cheeks) in direct sunlight. Above: Jolie Lip Boost alone on the lips...the color-payoff of this shade is superb. Bottom Line: The latest releases from Gressa are utterly stunning. I love the multi-tasking nature of the Lumiere Fluids (very few products can be worn just as effectively on the eyes as on the cheeks) and appreciate how seamlessly they work with my makeup bag staples from Hourglass and Burberry. Summer may be behind us but the need to glow is seasonless! Have YOU tried Gressa? What are some of YOUR green beauty favorites? I took a plunge and ordered some products based on your recommendation. They forgot to include the Elise in my shipment so I hope it will be shipped separately. Also, the brush is poorly made and immediately came apart when I took it out of the package. I like the Jolie lip boost and look forward to trying the foundation today. Just a little disappointed so far with service and quality of brush (I will return it). Sorry to hear that, Amy...I have had exemplary customer service with Gressa and haven't experienced the same thing with the brush. I recommend following up with them as they definitely aim to please the customer!